BBC News reaches about 40 million adults in the UK every week - its international services are consumed by an additional 239 million adults around the world. The department is the largest in the BBC in terms of staff, with more than 8,500 people around the UK and the rest of the world. BBC News incorporates network news (the newsroom, news programmes such as Newsnight and Newsbeat, political programmes such as the Daily Politics, and the weather team), English Regions and Global News. Material is brought into the BBC by its newsgathering staff, one of the largest operations of its kind in the world, with more than 40 international bureaux and seven in the UK. It is transmitted to audiences on an increasingly diverse range of platforms including tablet computers and mobile phones. • The area of all floors in the building is equivalent to 10 football pitches. The 24-hour newsroom is responsible for the One, Six and Ten O'Clock bulletins, the BBC News channel, radio bulletins and summaries, BBC World, the World Service and the BBC News website. 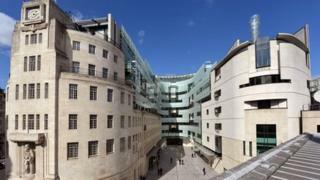 Since 2013, nearly all this output has been produced and transmitted from the new wing of Broadcasting House (NBH) at the north end of Regent Street in central London. It is tucked behind the original Art Deco building that was opened as the BBC's first purpose-built headquarters in 1932. NBH is occupied by 3,000 journalists and production staff in the news division. At the heart of the building, occupying the basement and ground floors, is the multimedia newsroom, the biggest in Europe, which brings together all the BBC's network and global news production for the first time. From here, BBC journalists, many of them specialists, deliver high-quality audio, visual and text accounts of breaking news and significant events with merged teams and shared content to meet the world's appetite for on-demand news. BBC Breakfast and Radio 5 live are broadcast from MediaCity UK, in Salford Quays, approximately two miles from Manchester city centre. Radio 5 live news employs about 130 journalists who produce some 75% of the network's output, or about 130 hours a week. The BBC has many major daily and weekly current affairs programmes, investigative journalism and major interview programmes, including Panorama, Today and Newsnight. It also provides services focused on distinctive audiences, including BBC World Service news programmes such as Newshour and BBC Radio 1 news programmes such as Newsbeat. This is the home of much of the BBC's original journalism and material is shared across news outlets to enrich content for as many audiences as possible. The BBC's political output is based within a stone's throw of the Palace of Westminster, from where it reports on the decisions and activities of the UK government, MPs and peers. It makes and broadcasts programmes such as Today (and Yesterday) in Parliament on Radio 4, and BBC Two's Daily and Sunday Politics as well as the BBC Parliament TV channel. It also provides a huge amount of material for BBC network TV and radio outlets, the BBC News website and regional TV and local radio. Elections - local, general and European - are covered by BBC Westminster. The political research unit provides background information and reliable statistics on parties, policies and polling, producing indispensable election guides which are studied and treasured by politics geeks and other staff across the corporation. "Where do you get the news from?" is a question frequently asked by audiences and the answer is, for the most part, BBC newsgathering. Some news is scheduled and planners and staff, known as news organisers, are able to deploy in advance correspondents, producers, camera crews, and on occasion, the BBC helicopter. Even with advanced warning, meeting the demands of all the BBC outlets can present a challenge for reporters, who might face requests for a two-way - or live interview - in the first minutes of the Today programme just after 06:00, frequent appearances on the News Channel and network radio throughout the day, a piece for the website and a package for the Ten O'Clock TV bulletin, with an update for The World Tonight. Newsgathering, home and foreign, must also respond to unpredictable events such as murders, floods, transport crashes, earthquakes and wars and rumours of wars. It can be a dangerous calling. Foreign correspondents, producers, camera crews, fixers and translators frequently risk their lives to draw attention to the history of the world as it unfolds. BBC Global News includes the BBC World Service, BBC World News television, bbc.com/news (the BBC's international-facing news site) and BBC Monitoring. The BBC's international news services attract a global audience of 239 million in more than 200 countries and territories. Together they represent the voice and face of the corporation to the rest of the world. BBC Global is increasingly working with partners to build audiences across the United States, Asia and Africa. BBC English Regions, part of the BBC News Group, is made up of 3,000 staff based from the Channel Islands in the south to the border with Scotland in the north. It is split into 12 regions, each broadcasting regional news programmes throughout the day along with weekly politics, current affairs and sport shows from their regional centres. Each region has up to six local radio stations and up to six BBC local websites. There are also teams working in bureaux in Northern Ireland, Scotland, Wales to provide programming for their own national audiences as well as contributing to network news. The BBC's 40 local radio stations reach more than seven million listeners across the UK. The BBC weather centre produces forecasts for TV, radio, online, mobile and Red Button, in partnership with the Met Office. The BBC weather presenters are all trained broadcast meteorologists. As well as the challenge of producing daily and weekly output, a small number of BBC journalists, engineers and technologists focus on creating new ways of covering and delivering the news. The Operations team in Newsgathering focus on audio, video and text from the BBC's correspondents on location, while BBC News Labs leads innovation in digital news.